Following the backlash over cutting funding for the Special Olympics, Education Secretary Betsy DeVos spoke up today to say it was being done for the best of reasons. DeVos said confronting the adversity and hardship the loss of funding would entail would do them good. She said they could easily make the money back by marrying someone whose father sold junk in a pyramid scheme and made a fortune. 9 Comments on "Betsy DeVos Says Special Olympics Funding Was Cut So Athletes Learn To Face A Challenge"
SHE REALLY SAID THAT!!!! REALLY!!!! She’ll face a challenge if she thinks she wants to see the pearly gates. It’s be easier for her to see a red spear. If funding needs to be cut, cut funding that is going from public schools to private schools. If they want federal funding, they too need to accept all students with disabilities especially those for which you cut the funding. I have always been a proponent of private schools, but since research is proving they are providing similar results as the public schools for students for whom public funds were approved to send students to private schools has me wondering as to their true effectiveness. Whete resources are available, the schools do well. Urban schools who are stricken with students in poverty continue to not have resources, yet they are juged using the same standards. On a personal note, I challenge you to go a month without limbs and access to resources that can help. You will have live as those kids do. You cannot use your status and your friends for help. You cannot acknowledhe who you are. Live your life in their shoes. Then please explain to the teaching community, those students’ families, and to the citizens how you were treated, the challenges you faced, and why you feel it is still a good idea to cut funds that help build self-esteem. They already know what it is like to have to “earn” surviving each day. Please open your eyes and see the world as it is. I apologize for my mispelling. It is diificult to see letters and type when you have poor vision and ot fades in and out. I dont expect Ms. Devos to understand that either. She has NO IDEA about the challenges these children face and their families! It’s a lifetime commitment of heartache and love. This woman is pitiful. 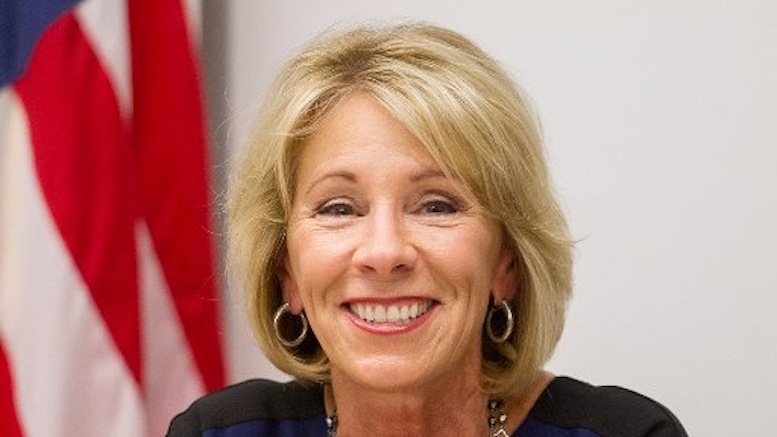 I graduated from the same college (Calvin College) as Betsey DeVos, and I have sent a letter to the president of Calvin suggesting he rescind Ms. DeVos’s diploma, since she clearly absorbed little of the philosophy Calvin College espouses. She is one to talk, her whole life was handed to her because of name and wealth. You have to start realizing this form of stupidity is from inbreeding. “They need to learn what it’s like to face a challenge.” Gosh, I thought that’s what the Special Olympics did?!? How condesending and ignorant. You clearly have NO idea the challenges disabled face on a daily basis.